True North Trout strives to be a one-stop resource for information and insight on fly angling for trout, char and related salmonids along the storied waters of Northern Michigan and the Upper Great Lakes bioregion. Content comes from a variety of sources, but includes contributions from field editors and writers who represent, and are active in, the fly fishing life. True North Trout also provides links and referrals to other quality sources of information via a links resource, and provides a bulletin board service where anglers can share and discuss their experiences on and off the water. If you are interested in contributing to True North Trout, feel free to contact the editors at admin (at) truenorthtrout (dot) com. Contributions can take the form of articles, interviews, how-to and instructional content, profiles of rivers, people, fly patterns, etc., or contributions of creative nonfiction, poetry, photography, or art. Contributions remain the property of the contributor, and True North Trout does not require exclusive right to publish in order that those contributions be considered. 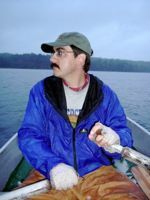 True North Trout is edited by Brian Kozminski (a/k/a “Koz”). Koz is an obsessive angler, fly tier, and defender of quality water and public access. He has been deeply involved in Trout Unlimited, including leadership roles with the Miller VanWinkle Chapter. He is a GreenFish ambassador and promotes the use of correct technique in catch-and-release fly fishing. He lives with his family in Hemingway country in northern Michigan where he can often be found on the water or at the tying bench. In his paid life he works in the service industry. 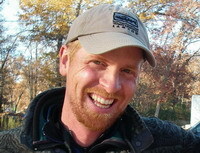 Jordan J. Lindberg is the founder and digital publisher of True North Trout. 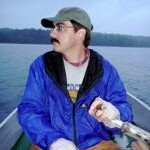 An avid fly angler and fly tier, Jordan was born and grew up in Traverse City, graduating from the Traverse City Senior High in 1987. After stints at Albion College, Michigan State University, and the University of Missouri-Columbia, he took at teaching and research position for almost ten years in the philosophy department at Central Michigan University. He holds a Ph.D. in philosophy. He lives with his family in East Bay Township. Currently he serves as Executive Vice President of eFulfillment Service, Inc., owns Stardust Memorials, LLC, and is the publisher and editor of True North Trout. Bryon Anderson moved to Michigan from Missouri in 1997 and quickly discovered that he belonged here. 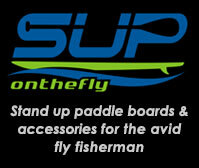 He is a passionate (some say obsessive) fly fisherman, fly tier, and fly rod builder. A graduate of the University of Missouri-Columbia, he has worked as a high school teacher and long-haul truck driver, and now works for the State of Michigan as a Disability Examiner. He is the proud father of twins and resides in Holland, MI. He is a contributing editor of True North Trout. 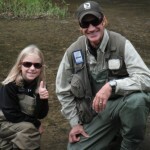 Ted Kraimer is a fly fishing guide living in Traverse City. He takes his customers to many of our great local waters in pursuit of the diverse fishery. 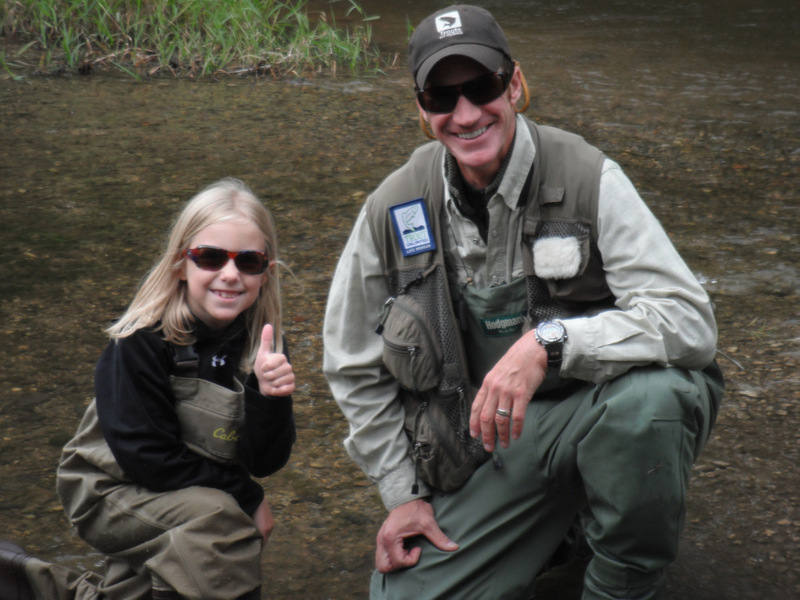 With close to 20-years of fly fishing experience, his avocation eventually became his vocation, and he operates Current Works Guide Service, LLC. Working in a fly shop while in college gave him the opportunity to teach the sport, and has been an FFF Certified Casting instructor the past ten years. While not on the water with customers you can find Ted fishing himself, continuing to look for that edge, or at his vise tying flies. Ted is a fly designer for Rainy’s Flies. 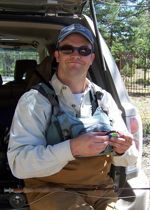 Through his work with T|N|T and on his own site, Ted contributes a fishing report on many of the local rivers in the area. Ted is a field editor and contributor for True North Trout. Publishing assistance by John Di Giacomo, Esq. Photography and web support by Matt Burden. Additional publishing assistance by the regulars at the pub, tying bench, and gameroom at Stillpointe Lodge.